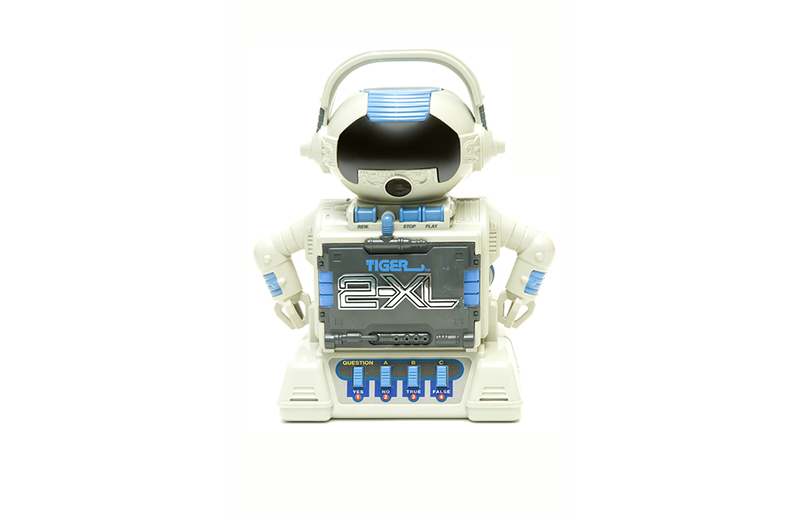 The original 2-XL talking robot from Mego offered a myriad of educational programming on a variety of different topics recorded on 8-track tapes. Children interacted with the 2-XL by listening to questions and providing answers. Pressing buttons caused the toy to switch between pre-recorded tracks, thereby appearing to respond to user input. Created by Dr. Michael J. Freeman it enjoyed a four-year shelf-life, from 1978-1981. In 1992, Mego closed. Ten years later, in 1992, Tiger Electronics re-introduced 2-XL. Known as the 2-XL Type 3 to collectors, this version of the toy offered enhanced sound quality, and a technology upgrade – outdated eight-track tapes were replaced with standard audio cassettes. While Tiger’s version continued to use Dr. Freeman as the voice of the toy, the 2-XL had a whole new look. A more pronounced body design that was 3-inches shorter than the original. The 2-XL’s eye still lit up like its predecessor, but also included a mouth light that blinked in time with the audio. Portability was also a feature of the Tiger version. In addition to a carrying handle at the top of his head, this 2-XL was capable of running on 4-D batteries in addition to an optional AC adapter. An integrated headphone jack also made it possible to listen to 2-XL without disturbing others – perfect for long road trips. Tiger Electronics’ run with the 2-XL lasted for 3 years. During that time, the company released over 40 educational and story/adventure tapes for the toy, including tie-ins to Marvel and DC superheroes, Star Trek: The Next Generation, and Jurassic Park. The popularity of the Easy-Bake Oven in the United States resulted in Kenner marketing the toy in a variety of international markets, including Japan.